Remember when quadcopter drones juggled balls and formed up into a Star Trek logo? That seems downright quaint compared to what we just saw at Lady Gaga's elaborately produced Super Bowl halftime show. 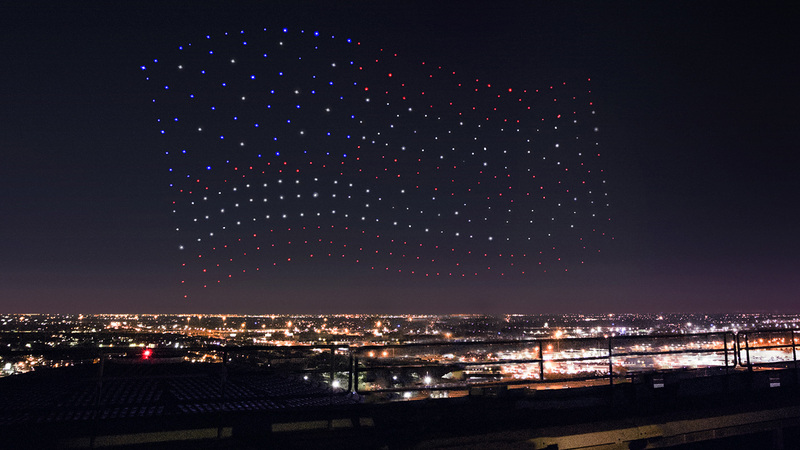 During her first number, 300 Intel drones formed the shape of an American flag, punctuating the singer's wire-assisted fall to the stage below. The "Shooting Star" drones Intel introduced last year are a foot across and weigh just eight ounces, thanks to a foam body designed to soften impacts. Each is equipped with a special LED that can produce four billion color combinations including, obviously, red, white and blue. The performance is coordinated by a central computer that can do unlimited UAV animations in three dimension. Intel recently set a world record by flying 500 of them together (video, below) and said "we hope this experience inspires other creatives, artists and innovators to really think about how they can incorporate drone technology in new ways." The sophisticated algorithms even check the battery levels and assign lesser roles to weaker drones -- if one should drop out, a reserve unit automatically takes its place within a few seconds. If you're wondering how Intel pulled this off in a huge crowd under airtight security with strict FAA flight regulations, the answer is slightly disappointing. The drone performance was actually taped on an earlier night, and didn't appear live to the crowd at Houston's NRG Stadium (except on the Jumbotron). Nevertheless, as Intel refines quadcopter performers, you can expect to see them providing grand-scale spectacle in place of, say, fireworks or skydivers. And while might be a waste of their true potential, the algorithms it's developing might eventually help make rescue, delivery and other tech possible.